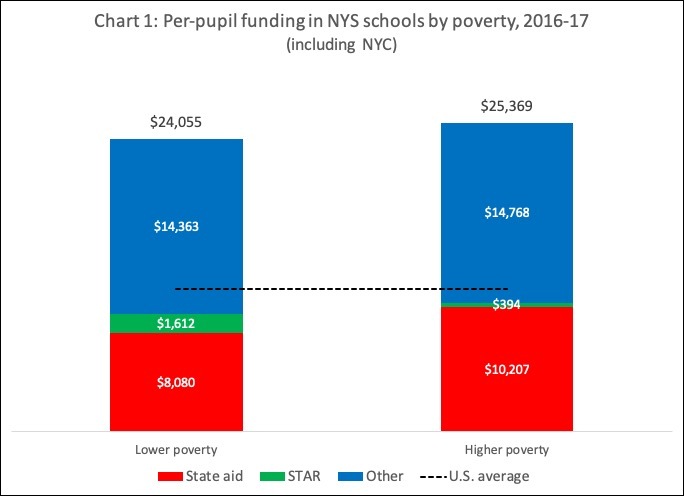 It’s commonly perceived that New York’s education funding system directs more money to wealthier, whiter schools than to poorer, less white schools – and that the distribution of state aid reinforces those inequities. 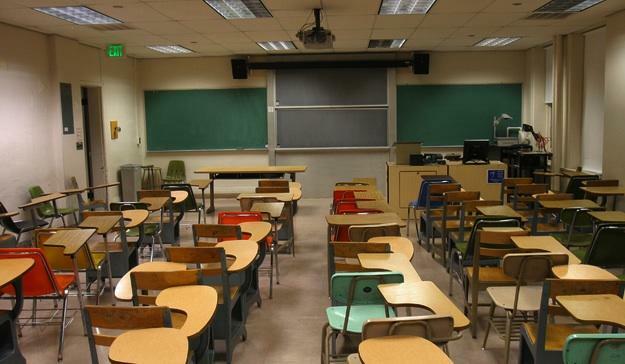 Funding gaps do exist, such as the striking disparity between Jericho and Westbury, neighboring districts on Long Island, as recently spotlighted by the Wall Street Journal. Looking at the totality of school spending across the state, however, different patterns emerge. For example, schools serving the lower-income half of the state’s students collectively spend $25,369 per pupil, which is 5 percent more than schools serving the higher-income half (see Chart 1). The poorer schools’ share of state aid was 9 percent higher. Similarly, schools with a majority of non-white students spend $25,387 per pupil, or 7 percent more than majority-white schools. (see Chart 2), while receiving 5 percent more state aid. A complicating factor in these analyses is New York City. 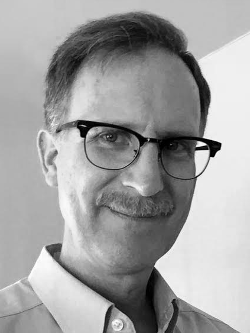 It’s a rare case of district with a high-poverty, majority-non-white student population that also has a concentration of wealthy residents and, through its own income tax, the ability to raise large amounts of revenue. It spends far more local funds and draws far less state aid than typical for a district with its income and racial demographics. Because of its size – 1.2 million students, or 40 percent of the state total – its spending has a significant effect on statewide figures. If New York City is removed from the calculation, the picture changes. Total per-pupil spending for majority-non-white schools dips slightly below the total for majority-white schools, by 0.6 percent. 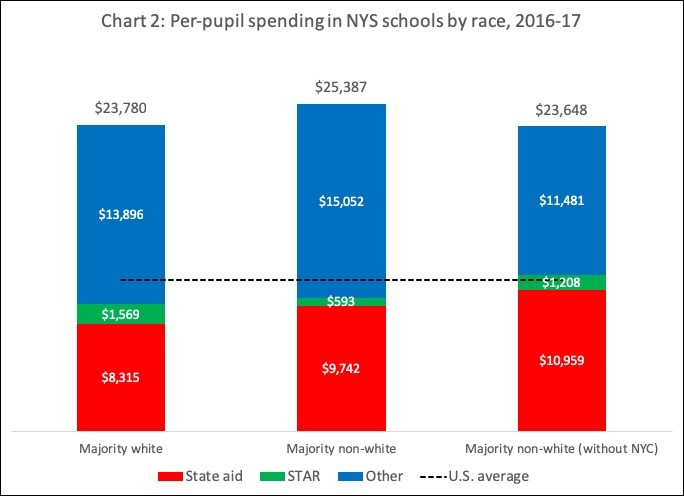 At the same time, the non-white schools’ advantage on state aid grows to 23 percent – $12,200 per pupil, versus $9,900. 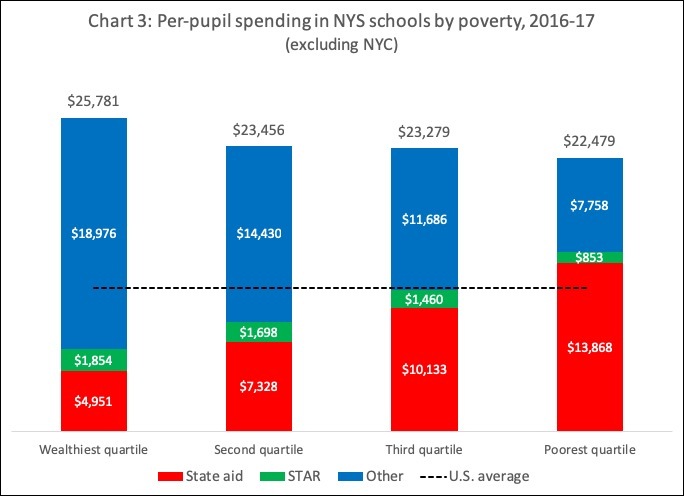 Excluding New York City, a 13 percent gap in total funding appears between the poorest and wealthier quartiles of students, as shown in Chart 3. That’s in spite of the fact that the poorest schools receive 116 percent more state aid than the wealthiest. Zeroing in on schools that are both low-income (with poverty rates above 20 percent) and racially concentrated (either more than 75 percent white or more than 75 percent non-white), a similar dynamic occurs. 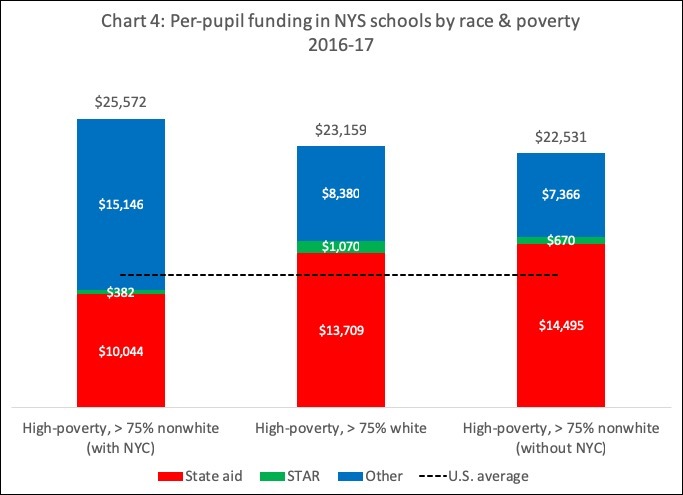 With New York City included, the non-white, high-poverty schools have more total funding but less state aid than the white, high-poverty schools. Without New York City, the opposite is true (see Chart 4). These gaps may be partly related to school size and location. High-poverty white districts are much smaller – with an average of fewer than 1,000 students, compared to almost 15,000 for high-poverty non-white districts excluding New York City – which tends to drive up per-pupil spending. High-poverty white districts are also generally more rural, which increases transportation costs. First, the gaps in total spending outside New York City, where they exist, are driven by local spending, mostly from property tax revenues — over which Albany has no direct control. Second, the distribution of state aid partially offsets those gaps by directing relatively more funds to poorer and less white districts. Third, the School Tax Reduction program, or STAR, which is designed to offset the burden of property taxes, generally directs more money to wealthier, whiter districts. Without that program, the funding gap between the richest and poorest schools would be about $1,000 smaller. Fourth, New York schools in all categories – rich and poor, white and non-white – spend much more than the U.S. average, which was $11,762 in 2016. Schools with a majority of non-white students spend $25,387 per pupil, or 7% more than predominantly white schools.